On the other side of Scotland, in East Lothian, Thomas Bell, a twenty-seven-year-old bachelor and farm bailiff, was also tempted by the offer of a new and exciting life on the other side of the world. Thomas was the eldest son of James Bell, a ploughman from East Barns, only a few miles from the east coast of Scotland and exposed to the elements of the North Sea. He would be one of many from a concentrated area, within a triangle drawn from Haddington, North Berwick and Cockburnspath, to settle in Argentina over the next quarter of a century. By the middle of May, most of Robertson’s recruits: farmers, ploughmen, tradesmen and their families, had arrived at the thriving Edinburgh metropolis. For most, travelling from the country and from villages with no more than a thousand inhabitants, it must have been a shock to their senses. The grey granite castle dominated the skyline of the Old Town, which had become so overcrowded that many lived alongside the rats in windowless rooms beneath the High Street. However, across a new monumental bridge to Edinburgh New Town lay a more genteel part of the city, occupied by the middle class. Whereas Glasgow had expanded rapidly, through industry, Edinburgh was home to banks, insurance companies and stockbrokers, making it the largest financial centre outside of London. The population of the city had grown by 50 per cent to 150,000 since the turn of the century, and was further increased by the transient tourists who were flocking to Scotland, encouraged by the works of Sir Walter Scott. To cope, eight mail coaches and fifty stage coaches were leaving the city every day.5 Add to this the excitement and apprehension of the trip ahead and the sadness of leaving families and friends behind and one can imagine the mental turmoil of the migrants as they waited in lodgings before being called to their ship. At Leith, Edinburgh’s port, from where the group was to depart, things were different, but no better. Dockers and porters milled around looking for work; sailors sought their pleasure between voyages and carts clattered along the cobbled streets, ferrying goods and passengers to the dockside for onward transfer to their ships. The noise was relentless, from humans and livestock alike. During the next two and a half months, life on board the Symmetry was tedious and most of the time William Grierson, in his diary of the voyage, is restricted to a dry account of the weather.7 The monotony was broken only by the occasional storm, bouts of seasickness and other ailments amongst the passengers, and the birth of children or Grierson’s piglets. It was therefore with relief that, at the end of July, land was finally sighted and the Symmetry slowly moved from the Atlantic Ocean into the mouth of the River Plate, the widest river in the world. As they passed a point adjacent to Montevideo, the colour of the river gradually changed to a muddy brown, the result of sediment moving down and out of the rivers Parana and Uruguay. On 8 August the Symmetry dropped anchor off Buenos Ayres. The channels around this port city were difficult and, as there were no landing piers, moles (sea walls), which were only accessible at high tide, had to be used. In order to reach dry land, passengers and equipment had to be decanted from ship to large rowing boats called whalers, and from boat to shore by a carty. These were extraordinary horse-drawn carts with large-circumference wheels to keep both people and goods above water when access to a mole was not possible. It was a full three days before the arduous process was complete and all of the prospective colonists had set foot on the unpaved and muddy roads of Buenos Ayres. In trepidation, some carried loaded pistols purchased before they had left Scotland, which, at the very least, provided some psychological protection against any perceived threat from the dark-skinned locals speaking in a strange tongue. After a couple of days in Buenos Ayres, the party made the six-league (c. 36-mile) final leg of their journey using the traditional method of transport from the city to the pampas: a train of bullock carts. Six beasts pulled each cart, which were made entirely of quebracho wood, some covered with a tolda made from a thatch of small sticks covered with hide in order to protect both passengers and their chattels from the elements. 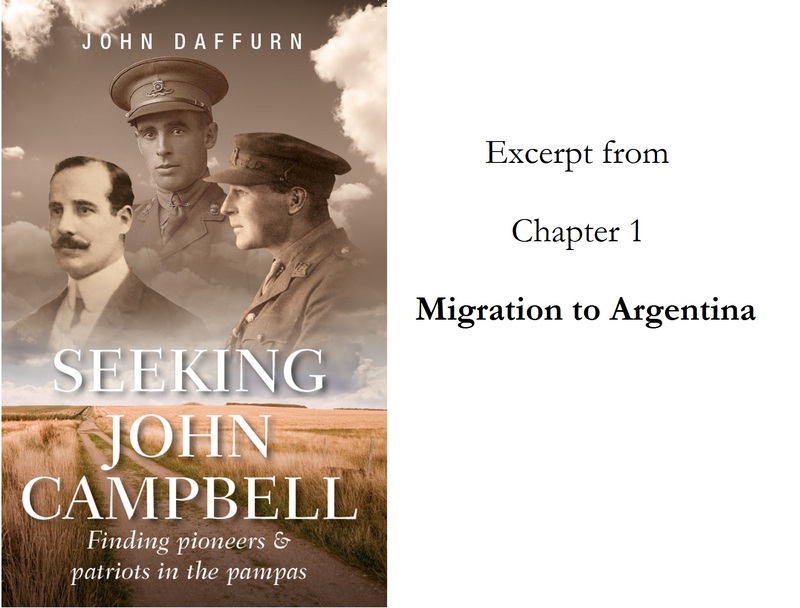 The Scots were apparently unimpressed by Buenos Ayres and so, with relief, the migrants moved out of the city area into the pampas. However, this landscape was also alien to them. The land was flat as far as the eye could see, creating a big sky which, if the weather was fine, was studded with white cotton-wool clouds. Few trees existed to provide depth and colour to the vista and only the colour of the wild verbena and other shrubs broke up the acres of pampas grass swaying in the breeze. A month, almost to the day, after stepping onto Argentine land, Hugh Robson’s wife gave birth to a son, their eighth child, and in recognition of the efforts of the Robertson brothers they named him William Parrish Robson. Hugh’s immediate family was now complete, and many years later his great-grandson, John Argentine Campbell, would become the subject of my research as a possible father for Isabel.